The first wresting matchup on Wednesday, December 20 was in the 170-weight class and featured Connor Getchel. Getchel made a very good effort, but the points went to Bonny Eagle. Next, an expedition match occurred. An expedition match is where two wrestlers in different weight classes (in this case, the 120 and the 113 weight classes) wrestle each other. Sam Dubac wrestled in this match and won, earning The Eagles points on the scoreboard. DJ Pelletier was next from The Eagles to take on Bonny Eagle. He was wrestling in the 126-weight class. After a demanding three rounds, Windham won that match. Next, Josh Barrett wrestled in the 132-weight class. It was a tough three rounds, with Barrett giving 100 percent. In the end, Bonny Eagle won in that weight class. George Butts wrestled in the 152-weight class. Bonny Eagle got the points there. There were several forfeits from both teams. A forfeit occurs when one of the wrestlers on either team, are not present in that weight class in order for that match to occur. Windham forfeited in the 106, 113 and 285 weight classes. Bonny Eagle forfeited in the 120, 160 and 182 weight classes. The final score was Bonny Eagle, 42 Windham, 30. In these individual matches that wrestled, I saw each Windham team member not getting discouraged if they lost. Windham strives to win and sometimes comes up short, but The Eagles are resilient. 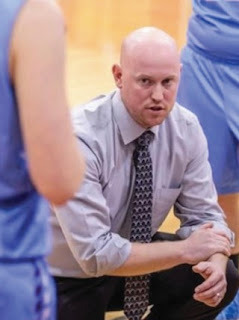 Brody Artes is in his sixth year as a head coach for the Windham High School girls’ varsity basketball team. He graduated from Penobscot Valley High School in Howland, Maine in 2003. He then went to the University of Maine at Farmington in 2007 and got his bachelor’s degree in Secondary Education in Mathematics and then went on to get his master’s degree in Educational Leadership from the University of Southern Maine in 2011. Coach Artes likes to coach because it gives him the opportunity to connect with kids outside the classroom. He enjoys watching kids find success in athletics; as there are many life lessons to be had when participating in an athletic program. “Learning how to compete is a lifelong skill that everyone needs, especially when kids enter the workforce. Striving for a goal and competing to reach that goal is what athletics does for our youth,” says Artes. Artes has quite a coaching background, coaching multiple sports in Windham that include roles as varsity assistant and first team coaching staff with boys’ basketball in Windham from 2007 to 2012. He is also currently the varsity baseball coach at Windham High school and has been for the past six years; working as the junior varsity coach five years prior. He also just finished his second season as JV golf coach in the fall. “The team is still young, but [they] are working hard each day to [improve],” remarks Artes. Artes enjoys running and golfing. He and his wife Lindsay, who have been married for three years,enjoy life together with their dog, Rufus. Good luck to Coach Artes and the girls’ varsity basketball team! 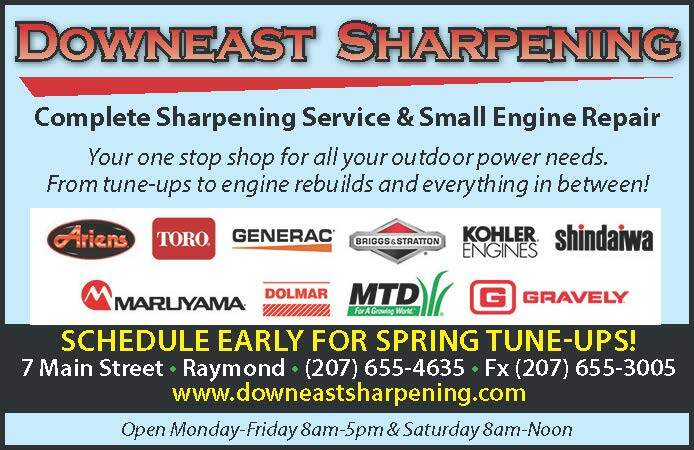 We look forward to an awesome season. 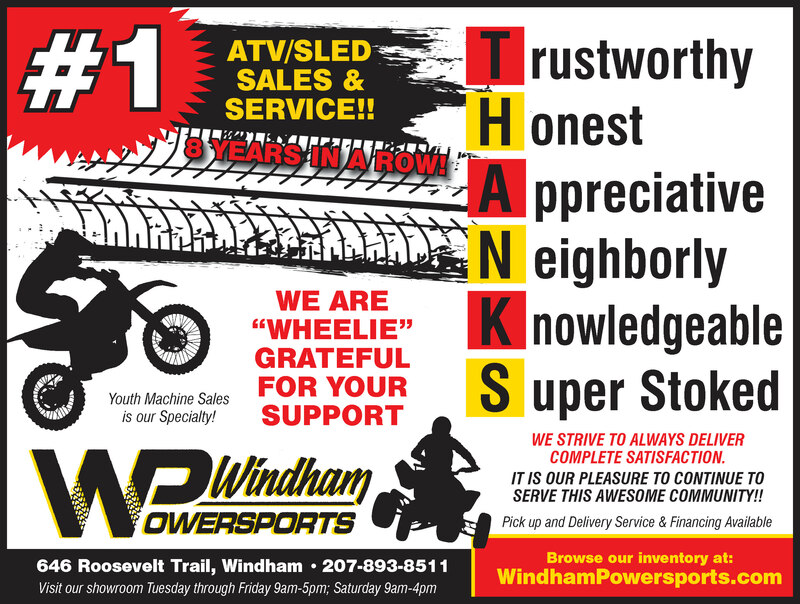 Congratulations to the Windham Swim Team for a great meet against Portland last week. It was closely fought with Portland winning the girls 83 to 80 and the boys 78 to 71. The team swam very well, missing qualifying times by a very small margin. Congratulations to Katharyn Lucas who qualified for her third event, the 200-free swim. We look forward to many more qualifying times over the next few weeks. The team swims against Sanford on Saturday, December 23 and the very exciting Morse Invitational on Tuesday, December 26 in Bath. It's a privilege being invited to swim the Morse Invitational and a great time to see some of the best swimmers in the state compete. The girl’s JV and varsity basketball teams kicked off their seasons against Cheverus last Friday, December 1 with back to back home openers. Both teams played very well, which made for two exciting games. The JV girls started strong having control of the ball over Cheverus. Windham’s forceful offense and defense kept Cheverus at bay from the start of the game. Anna Drummond, #13, scored after stealing the ball from Cheverus. Shortly after, she scored again. Windham’s impressive communication and teamwork led to several other players scoring early. Lexi Hirning, #24 and Lexi Bailey, #34 scored in the first half. The Lady Eagles continued their intensity throughout the first half, keeping sufficient distance - points wise, ahead of Cheverus. Windham protected their lead by conducting several turnovers against Cheverus. Before the end of the first half, several Lady Eagles had put points up on the scoreboard. Erin Elder, #22, scored, Lexi Hirning and Julia McKenna, #21, scored single points from foul shots. Lexi Hirning sunk a three pointer, Hayleigh Moody put two in the basket. Julia McKenna scored one point via a foul shot and Molly Hodgkins, #12, sunk two. At the half, the score was 23-14, Eagles. Windham came out just as strong in the second half; they wanted that “W” and they were going to get it. The Eagles’ continued to control the ball and had great teamwork. Hannah Downing, #42, scored one point via a foul shot. After a turnover, Hayleigh Moody scored two. Lexi Hirning put two in the hoop. Erin Elder scored two. The Eagles’ lead was growing; Windham continued to pressure Cheverus. Molly Hodgkins scored again. Lexi Hirning put two more points on the scoreboard. 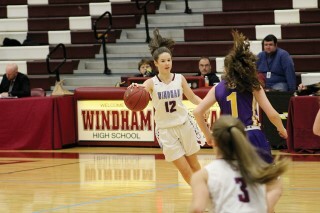 Erin Elder and Julia McKenna each got other baskets as Windham was pulling away from Cheverus. 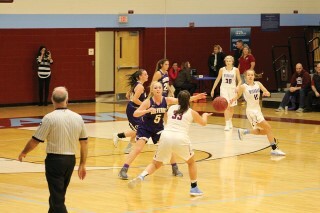 Maddie Rogers, #5, sinks a three towards the end of the game. 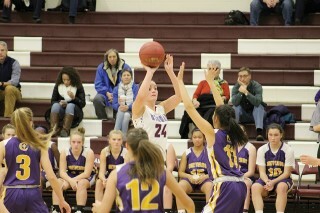 Molly Hodgkins scored one point from a foul shot. The clock was running out and even though the Eagles had a comfortable lead, they needed to keep up the defense in order to maintain that lead. At the buzzer, the scoreboard read Eagles 48, Cheverus, 40. The varsity girls wasted no time with Hannah Talon, #11, scoring immediately in the first half. The Eagle’s great offense and defense let Cheverus know that if they wanted to win, Windham was going to make them work for it. The Eagles were strong and aggressive, with several players scoring in the first half. Tara Flanders, #33, sunk one for two points. Hannah Talon put two points up on the scoreboard. Both Taylor Files, #20, and Meghan Hoffses, #2, scored putting in two baskets from foul shots. Windham’s energy resulted in several turnovers against Cheverus, helping the Eagles to put points on the scoreboard. Meghan Hoffses, Hannah Talon and Tara Flanders each scored, putting two in the hoop. Meghan Hoffses scored again after shooting two foul shots. Hannah Talon put a basket in after an assist from Meghan Hoffses. Although the Lady Eagles were giving it their all, Cheverus was right behind them, almost matching them basket for basket in the first half. At the half, the score was 24-23, Cheverus. The Eagles kept up the intensity in the second half. Emily Drummond, #30, scored. Hannah Talon put two baskets in and Tara Flanders got one in the hoop. The game was very close and Windham had to keep it up in order to put the “W” in the scorebooks. The Eagles continued to pressure Cheverus with Meghan Hoffses sinking a three, Tara Flanders and Kayla Gorman both getting single points via foul shots. Hannah Talon kept the pressure on Cheverus by sinking a three. Windham played strong with excellent teamwork in order to maintain their lead, which was very close at times. Hannah Talon sunk two foul shots. At this point there was less than a minute left on the clock and Windham was up by six. After Cheverus fouled Meghan Hoffses, Windham’s lead grew a little, but there still plenty of time left for Cheverus to catch up. A short time later, there was only eight seconds left on the clock and Windham led by three. After some tactical defense, the buzzer sounded and the Lady Eagles had game #1 in the books as a victory. The final score was 46-43, Windham. “It was a great team win overall; a lot of kids did a lot of positive things for us throughout the game. I’m real proud of how they came together as a team . . . to win the game . . . they are a great group of kids. We’ve been working hard to get to this moment.” said Coach Brody Artes. Congrats to both JV and varsity on their home opener wins! We look forward to an exciting season!